On 7 August 2008, Nikon Europe has released several new Coolpix S-series ultra compact cameras, i.e. S560, S610, S610c and S710 which offer different zoom ranges and resolution in order to cater to different needs and taste of everyone. These cameras comes in stylish design and have the fastest start-up times in their class. It is made for easy operation but does not trade-off for advance features such as Scene Auto Selector. This setting enable the camera to select most appropriate Scene Mode, such as portrait, landscape, night setting, or close up automatically. The Active Child Mode setting enables photographing of moving subjects such as children easily in sharp focus. Smile Mode allows a picture to be taken automatically when the person in focus smiles. Something additional on the S610C is its compliant with WPS (Wi-Fi Protected Setup) that allows secure connectivity to Wi-Fi routers for on-line storage and sharing of digital pictures via Nikon’s my Picturetown. COOLPIX S610C and S610’s small, elegant aluminium bodies with sharply-cut contours are good-looking and features 10-megapixels of sharp resolution. Both have a large 3-inch TFT monitor and four functions to help in blur reduction, i.e. Lens-shift Vibration Reduction (VR), high ISO (up to 3200), Best Shot Selector and Motion Detection. The S610C will be available in Black tentatively in market this September. 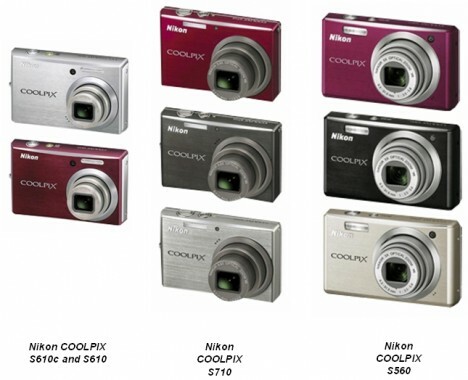 COOLPIX S610 will be in Titanium Silver and Deep Red will become available for retail on 29 August. COOLPIX S710 is a high-performance compact camera with 14.5 effective megapixels. It features 3.6x optical zoom with a wide-angle 28 mm. Four exposure modes on this camera (P/S/A/M) gives flexibility to user to take more control on the photography or to use automated mode helped by Scene Auto Selector. It comes in four anti-blur features which are lens-shift Vibration Reduction (VR), a sensitivity range up to ISO 12800, Best Shot Selector and Motion Detection. It also come with Face-priority AF in which it is able to recognise up to 12 faces. Its extra-large 3-inch wide-viewing angle TFT monitor with anti-reflection coating makes framing shots to be relatively easy. The exterior body is made of highly-durable stainless steel with stylish design. The S710 comes in Urban Black, Titanium Silver and Deep Red to be retailed as of mid-September. The S560 is a high-quality compact digital camera with 10 effective megapixels with attractively-priced. It is built of 5x NIKKOR zoom lens and a large 2.7-inch wide-viewing angle TFT monitor. The camera is designed for easy use while ensure superior quality of photo taken. Scene Auto Selector automatically choose appropriate settings whether shooting a portrait, landscape or fast action. In Smile Mode, the camera detects the subject’s face, focuses and automatically releases the shutter when the subject smiles. In addtion, it includes a blink warning when a subject has blinked during exposure. S560 is made of high-quality aluminium body and comes in three colors: Warm Silver, Sakura Pink and Black. This camera will become available for retail of end-August 2008.